1. Sieve the flours and 1 tsp salt into a large bowl; stir in the yeast. Put 140g crème fraîche and the milk in a pan over a medium heat. Stir until warm but not hot, remove from the heat and whisk in the egg yolks until smooth. Add to the flour mixture and mix into a thick, wet batter. Cover with a clean tea towel; leave to rise in a warm spot for 1 hour, until bubbly. 2. Whisk the egg whites to stiff peaks, then fold into the batter. Cover and leave to rise for 1 hour. Meanwhile, mix the remaining 170g crème fraîche with the horseradish; set aside. Thinly slice the cucumber, transfer to a bowl and mix with the vinegar, honey and the remaining ¼ tsp salt. Set aside. 3. Put a large non-stick pan over a medium-high heat and add ½ tsp butter. Once the pan is very hot, dollop in 2 tbsp batter per blini, taking care not to overcrowd the pan. Fry for 1-2 minutes, until just set and golden on the base, then flip over and fry for another 30-40 seconds until golden. Transfer to a wire rack to cool and continue with the remaining batter, wiping the pan clean and adding more butter for each batch. 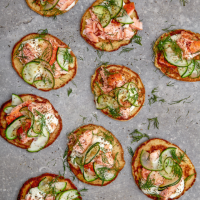 To serve, dollop 2 tsp horseradish cream on each blini and top with some salmon, some cucumber and a little dill. Season and serve immediately.